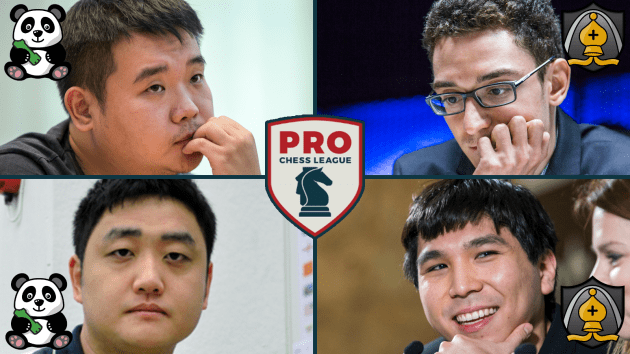 Two teams booked their tickets to the live PRO Chess League final four in San Francisco on Tuesday, as Saint Louis and Chengdu emerged victorious from their respective quarterfinals match-ups. The two PRO Chess League powerhouses will have to wait one more week before knowing their semifinals pairings, as the Arch Bishops will face the winner of the Eastern Division quarterfinal, and Chengdu will take on the Central Division quarterfinal winner in May. For crosstables and games from all matches, visit our weekly results page. Cast your vote in the game and MVP of the week polls! These two #prochess MVP nominees were critical to their team's victories yesterday. Cast your vote! The last time the Webster Windmills beat the Arch Bishops was in the second week of the 2017 PRO Chess League regular season, and it would appear that with GM Fabiano Caruana and GM Wesley So manning the top two boards for Saint Louis, that won't be changing any time soon. With Webster needing to take the final round 3-1, IM Nikolas Theodoru stepped up for the Arch Bishops, trapping Nyzhnyk's queen in the center of the board! The Saint Louis University student converted his extra material in the endgame to finish 3/4 on the night from third board. With Caruana beating Robson, CM Joshua Grabinsky's late win was not enough for Webster, marking the end to its season. The win means Saint Louis will return to San Francisco for the live PRO Chess Leage semifinals. Fittingly, after losing to Armenia in last year's event, the Arch Bishops will face the winner of next week's clash between the Armenia Eagles and the Tbilisi Gentlemen. With Wesley So unable to make the trip, team general manager Mike Kummer will have some important decisions to make these next few weeks. Even with its top two boards combining for 7.5/8 points, Chengdu nearly missed its chance to progress to the semifinals on Tuesday night against a balanced Minnesota Blizzard team. The Blizzard, who had lost in the quarterfinals last year in the Atlantic Division, were keen on making its first appearance in the live semifinals this May. The inevitable draw meant that Henriquez had to win an objectively equal position, and in trying to create winning chances, Wang Yue tallied another point for a 9-7 Pandas final score. The loss sees an end to another impressive season from the Blizzard, as the Chengdu Pandas move on to the live semifinals in San Francisco this May. The Pandas will next face the quarterfinal winner of the Norway Gnomes and the Baden-Baden Snowballs. Chengdu has not faced either team in PRO Chess League matches or in any Battle Royale. Commentary for this week of #prochess was provided by Robert Hess, Anna Rudolf, and Danny Rensch. All shows and archives are available at twitch.tv/chess. Just learning about the PRO Chess League? Visit the site and check out the official information article.